For four consecutive years, tefficient has benchmarked operators in Sweden, Finland, Norway and Denmark against a pure Nordic peer group. Unlike most other markets in Europe, UK’s MVNOs have significant scale and strong owners with large adjacent business in the UK. The recent decision of the European Commission not to allow 3 to merge with O2 meant that the UK (in a foreseeable future, at least) will continue to have four mobile operators (MNOs). This is something that most MVNOs salute since the number of host MNOs will remain intact and competition on wholesale prices likely will be fierce. In contrast to other benchmarks, our benchmark is 100% fact based without modifications done to actual MNO/MVNO data. In total, 10 MNOs/MVNOs (see the image at the top of the page) are considered to be invited to participate. As in all of our benchmarks, the identities of the actual participants will be confidential. It’s also important to know that the benchmark results are available to the participants – nobody else. 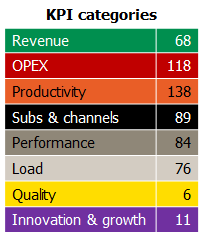 The benchmark covers revenue, OPEX, headcount productivity, subscribers & channels, performance, traffic & load, quality and innovation & growth for 27 functions within Marketing & sales (split on B2C and B2B), Customer service & telesales (split on B2C and B2B), IT, Support functions and Product development. [In order to allow comparisons of MNOs and MVNOs, all networks functions and the wholesale function have been taken out of the benchmarked scope. If minimum three MNOs participate, it can be added for these MNOs]. The benchmark report will cover 590 KPIs in total, distributed as in the table. If you like to participate, there is a fixed participation fee which includes a company-specific 200-page report, an on-site presentation to the management team and up to three department-specific on-site presentations. The timeline is synchronous for all participants – and is currently open for discussion. If you’re among the 10 MNOs/MVNOs, please contact tefficient for more information.